Welcome to 0 Defeat Firearms Training. Federal law allows qualified retired peace officers with at least 10 years of experience to carry a concealed firearm if they meet certain criteria including an annual qualification shoot. Completion of this shoot results in a certificate that can be turned into the county sheriff in Nevada for a LEOSA card. This shooting qualification is conducted in compliance with the standards of the Nevada Sheriffs' and Chiefs' Association and the Law Enforcement Officer Safety Act and requires 30 rounds of ammunition. I can also sign off on department specific courses of fire if your department authorizes a civilian instructor to do so and you provide me with a copy of the course of fire. I have a number of officers that come to me from different departments for off duty weapons qualifications. 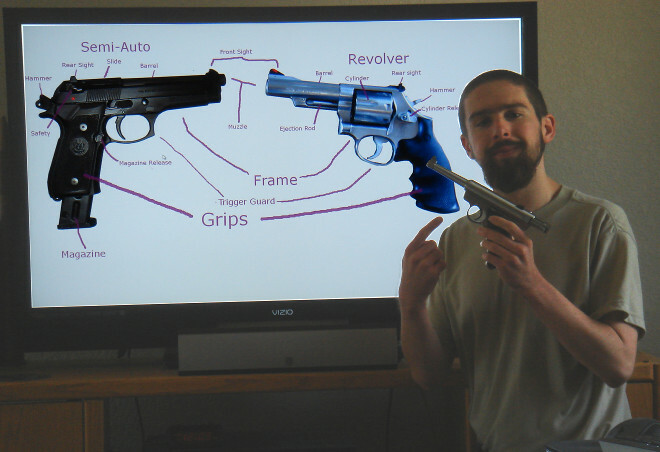 For $25 per hour, I will do private lessons for individuals or couples, starting with the basics of gun safety and the fundamentals of marksmanship. Within about 2 hours of training, you can go from knowing nothing about guns to having a basic competency with a handgun. Don't have a handgun? I also have some you can try out and help you find the one that suits you the best. NOTE: Please verify you are eligible for a permit by reading the eligibility criteria. Feel free to call me if you need clarification. This course meets the training requirements established by the State of Nevada for a concealed firearm permit. Topics include firearm safety, basic firearms handling skills, Nevada firearm laws, and Nevada self-defense laws. Monday, Tuesday - My house for up to 6 students. $50 for each additional student. Wednesday, Thursday - You supply the classroom. Friday - My house for up to 6 students. Saturday - My house for up to 6 students. $400 for up to 6 students. Sunday - You supply the classroom. $50 more for each additional student. $200 for up to 4 students. $40 for each additional student. $40 more for each additional student. Scheduled Courses: None scheduled. Courses can be scheduled now for the month of March. One-on-one courses: I prefer to do classes for groups, but most of the calls I am getting are asking to schedule a one-on-one course for a fraction of my group pricing. I do not offer a discount for a one-on-one course, and this has resulted in some angry callers. Please understand that I set a minimum price per day based on the cost of me taking time off of my other jobs to do these courses. Right now, I work 7 days a week, night shift. These courses can only be taught during the day. Each course requires multiple hours of preparation time. For me to teach a Saturday CCW course, I'm not able to work on either Friday or Saturday night, my two most profitable nights of the week. Please consider it from my point of view before making angry telephone calls. It is strongly recommended to bring the handgun you wish to carry and 30 rounds of ammunition. However, if you do not have a firearm or ammunition, a handgun will be provided to qualify with. For the Concealed Firearm Permit course, each student will be provided with ear and eye protection. Protective safety glasses and ear plugs will be given out and ear muffs can be borrowed. However, you may prefer to bring your own safety equipment that you are more comfortable with using, and are encouraged to do so. The shooting component of the course is conducted outside. It could be very cold or very hot. Dress for the outdoor weather. A hat is recommended to deflect shell casings and to keep the sun out of your eyes, as well as lotion to protect your skin from the ultra-violet radiation. For cold weather, gloves are recommended. Bringing your own lunch is recommended for the 8 hour courses. This course meets the requirements of the Utah Bureau of Criminal Investigations, and takes around 4 hours to complete. Click here for more information about these NRA courses, and the prices. 0-Defeat is located in Cold Springs, a suburb 17 miles Northwest of Reno. If you would like to schedule a date not listed, call or e-mail to set one up. The instructor is Greg Ross. He is NRA certified to teach the NRA Basic Pistol Course, the NRA Personal Protection inside the House Course, and the NRA Personal Protection Outside the house course. He is approved by Washoe County to teach the Nevada Concealed Firearm Permit Course, and approved by the Utah BCI to teach the Utah Concealed Firearm Permit Course. He is very knowledgeable about firearms and the laws that surround them, and he strives to provide a friendly and welcoming atmosphere to everyone without discrimination. Generally, the classroom instruction will be conducted from my house, but the shooting will be conducted either in BLM land or at a Washoe County shooting range. Each class conducted in my house will have no more than six students. This is an informal instructional environment but safety will be stressed at all times. This is a couch and coffee table classroom environment. Allergen Warning: My house is home to a cat and a chihuahua. By request, private classes can be held at other locations.